These screws are used for machine tools and positioning. 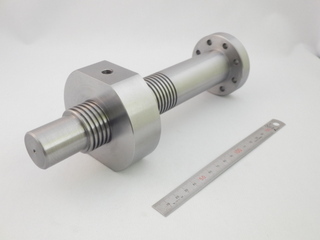 Trapezoidal screws are often used for linearly moving machine parts, etc. The section of the trapezoidal screw is trapezoidal, and there are also metric trapezoidal screw threads (Tr) whose angle of thread is 30 degrees and metric trapezoidal screw threads (TW) whose angle of thread is 29 degrees. Metric pitch is used for the former, and inch pitch is used for the latter. The metric system is used for the nominal outer diameters of both. The Tr threads are standardized according to JIS, but TW threads were discontinued in JIS in 1996. 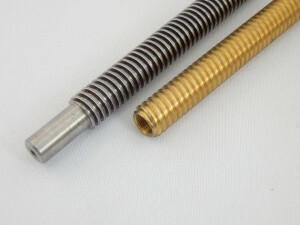 However, we can still manufacture TW screws. Please contact us if necessary. In addition, there are special screws called square threads whose section is square. They are used when a large force is applied in the axial direction. Since square threads are not included in JIS, the DIN standard is usually used. However, there are not commercially available taps, so female threads are manufactured through the turning process. Therefore, we ask customers to supply a sample if at all possible before manufacturing. For Tr threads, there is a standard, so a sample is not necessary. We also manufacture multiple thread screws that move multiple threads per rotation such as double-threaded screws that move two threads by one rotation and triple-threaded screws that move three threads by one rotation.